New Year’s parties and celebratory toasts are coming this weekend so it’s important to be aware of how to protect your eyes from dangerous hazards associated with New Year’s Eve such as flying corks, fireworks and confetti. You know the old saying, “It’s all fun and games until someone loses an eye,” so let’s make sure we keep New Year’s Eve safe for your eyes. 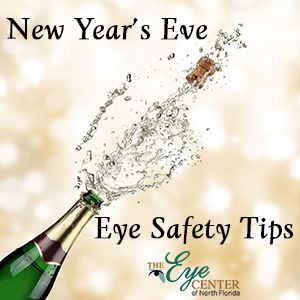 Here are some tips to ensure eye safety this New Year’s holiday!